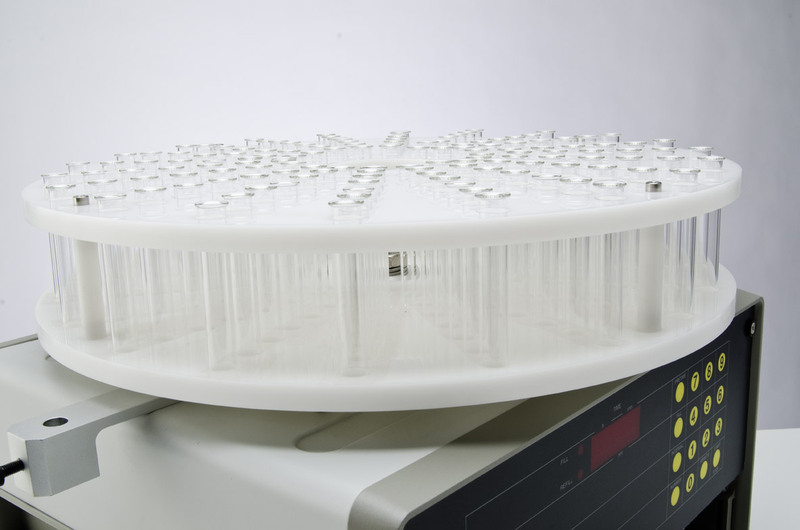 The offline DFC systems include a fraction collector or an auto sampler which will collect the sampled dissolution media. 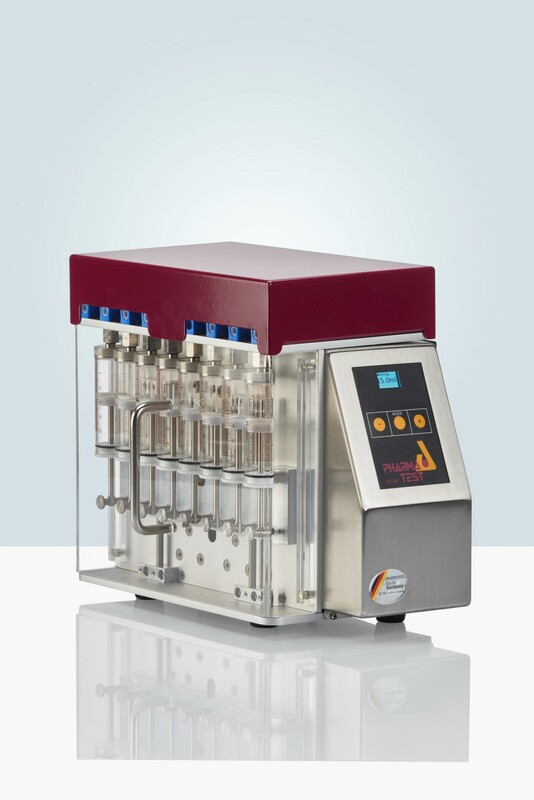 The semi-automated DFC-1220SP system is composed of a PTWS 1220 staggered stirrer start dissolution bath with built-in individual vessel centering, full tubing installation in PTFE including either in-situ sampling probes or the EPE-1220 auto sampling system, 2 PT-SP8 syringe pumps, and a PTFC-16 fraction collector. In this configuration the sampling probes are either always immersed into the media (in-situ) or removed after sampling (EPE-1220 system). Both procedures are widely used. 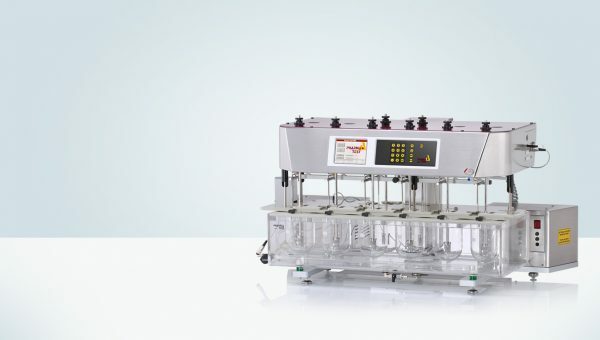 The PTWS 1220 dissolution bath with 12 stirred positions is the heart of the system. Semi-automated in this case means auto sampling for a dissolution test instrument at pre-programmed times. Automating this step alone eases the dissolution job a lot. 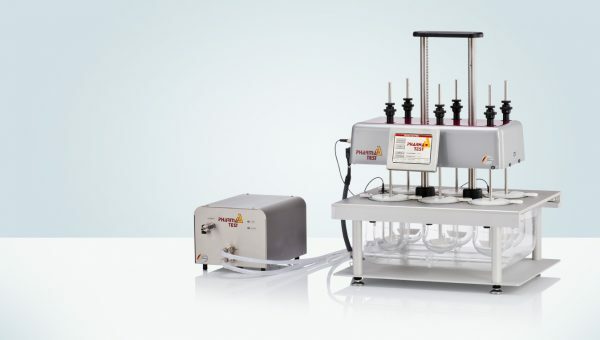 After all tablets have been dropped, the dissolution test proceeds automatically and all samples are simultaneously removed from each connected vessel. The sample is delivered into a connected fraction collector by a peristaltic-, or the PT-SP syringe pump. 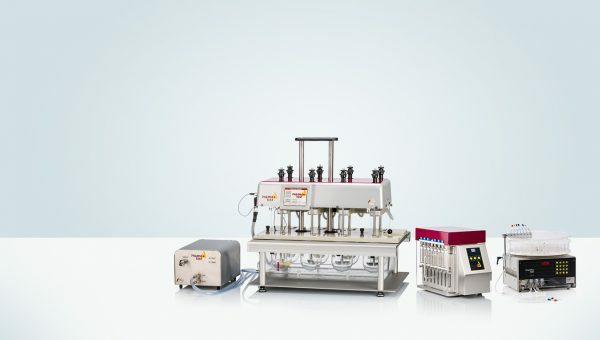 The system includes high precision PT-SP syringe pumps and a PTFC fraction collector. These systems do not require any external PC software to control them (the WinDiss ARGUS dissolution software package can be used optionally). Sampling information is entered directly at the connected PTWS 1220 dissolution testing instrument. All Pharma Test tablet dissolution test instruments can be upgraded with a pump and PTFC-16 fraction collector or DSR-M sampling robot. The perception of automation in dissolution testing differs greatly from user to user. The most labor intensive stage is taking samples at the specified time periods as found in the company SOP (Standard Operating Procedure). This involves the removal of 6 samples according to the USP/EP and most other Pharmacopoeia, there is often a requirement for a fast or parallel start in most cases so that accurately timed sampling may be achieved. At this point the operator must also consider either replacing the collected samples volumes in the dissolution vessels or keeping an accurate record of the volumes taken from each vessel so as to be able to calculate the true concentrations of subsequent samples. The pumps available are either peristaltic, piston pumps, or syringe pumps. The PT-SP syringe pump as well as the CAT valve-less piston pump will give first class accuracy in terms of volume removed and refilling from and back to the system when samples are taken. Although the quality of the peristaltic pumps available today has vastly improved, it must be stressed that the peristaltic pump is still working with flexible tubing and should be qualified at the start of each determination to make sure that the flow rates are identical for each channel and that the tubing itself is in overall good condition. A good tip for long tubing life is to always release the pressure rollers from the tubing either overnight or whenever the system is left for extended periods of time and not in use. The Ismatec® IPC 8, IPC 16 and IPC 24 series of pumps offers a reasonable cost solution for prolonged use. With the PTFC-2/8 fraction collector and their reverse liquid flow feature, the DFC systems provide the necessary control for sample transfer using this type of pump for standard off line systems. The CAT multiple piston pump units offer a more accurate solution to sample removal and transfer. 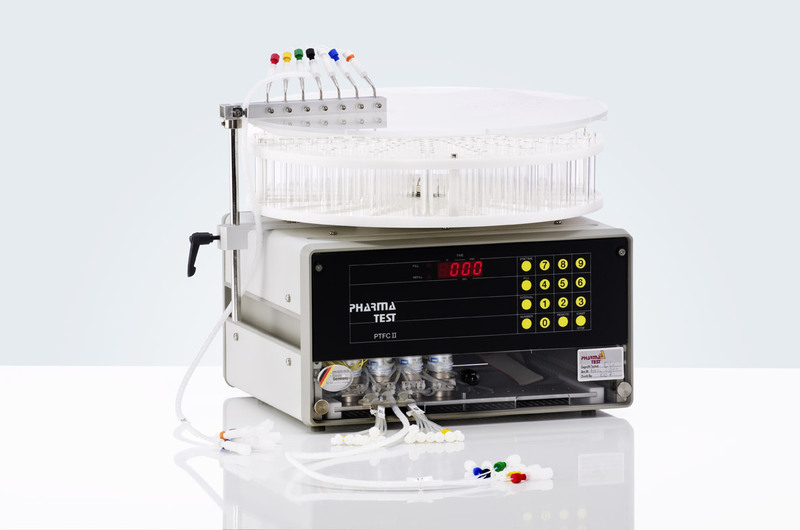 Exact volumes may be transferred from the sample vessels to a fraction collector such as the PTFC-2/8. In this way, as vessel refilling is not used, exact volumes of sample removal can be recorded for subsequent concentration calculations. 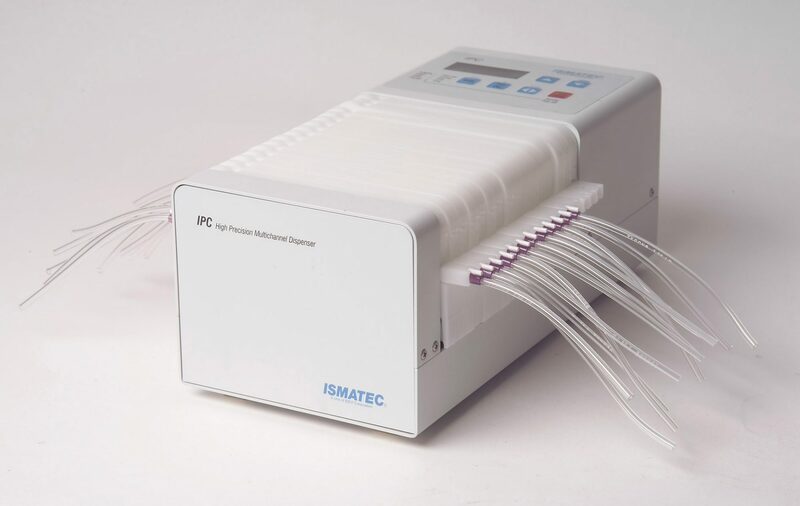 This system offers a more secure sampling method for non-closed loop or offline systems where the volume removed is calculated from an apparent flow rate over a fixed time period (as with peristaltic pumps). This system is not dependent on pump tubing quality and is also a good alternative when active materials are known to absorb on tubing materials such as Tygon or Silicone. The CAT pump is available with 6, 8, 12 and 24 individual pump heads, also for auto media refilling. As soon as the samples have been inserted, the system will start its automated operation. 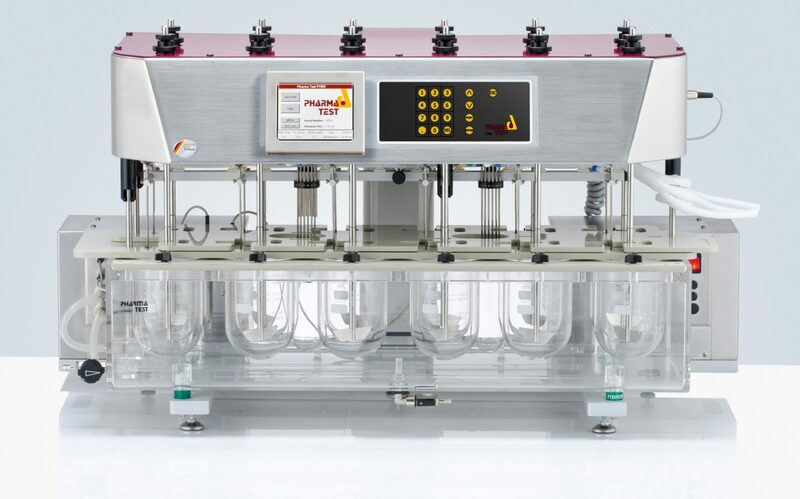 The sampling times have been programmed via the touch screen of the PTWS 1220 dissolution bath and are saved as a specific method for subsequent tests. After the start of test a command is sent from the dissolution bath to the PTFC-16 fraction collector and from there to the connected pump to start a sampling sequence. The EPE-1220 moves the sampling tubes and filter tips into the media to the selected sampling position. The pump will be started to fill up and pre-flush the tubing. 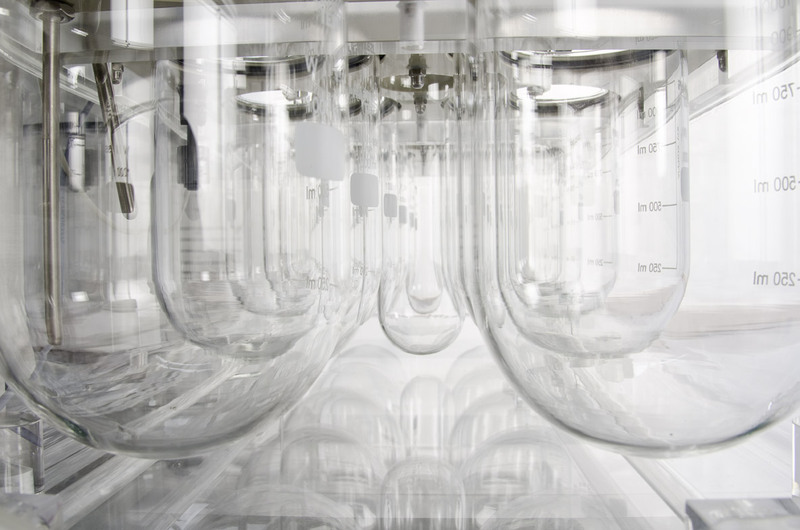 When all tubing is filled-up, the samples are collected into vials inside the collector dish of the PTFC-16. Depending on the system configuration, after dosing the volume will be refilled and the EPE-1220 will move back out of the dissolution vessels. At the end of a cycle all tubing is emptied. The system is waiting for the next sampling time. All vials are covered during the test; the vial dish can be easily removed. Also special dishes are available for HPLC vials. For more information about the pumps and the system have a look at our brochures.